About eight years ago, Chaplain Randall Runions began seeking pre-release work opportunities for inmates at South Central Correctional Center in Clifton, Tennessee. His search led him to a nonprofit called Joni & Friends, which helps people with mobility impairments across the globe. Inspired by the charity's work, Runions helped form a partnership between South Central and a Joni & Friends ministry called Wheels for the World. Today, South Central's Wheels for the World program gives inmates access to valuable work opportunities, and the chance to help people worldwide. 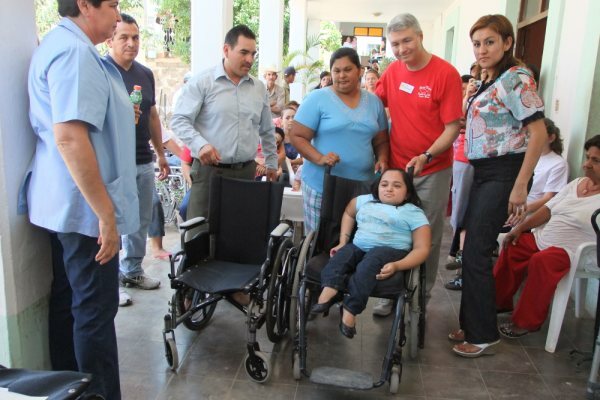 Participants restore donated wheelchairs, canes, crutches and other mobility equipment. Initially, the program offered jobs for 20 inmates. Due to its popularity, there are now more than 75 inmate workers, and the program continues to grow. For six hours a day, five days a week, participants overhaul wheelchairs, which often are in poor condition. Their 14,500-square-foot warehouse space within the facility is set up with tables in the main work area. Two inmates work at each table, fixing chairs from start to finish. When the items are complete, other participants serve in a quality control capacity to make sure all the repairs are up to spec. Then they prepare the equipment for shipping to other countries, from Israel and Sri Lanka to Uganda and Haiti. "We're teaching the men mechanical and sewing skills, where to store the parts, how to inventory them and more," Runions said. "And our quality control team – another specially-trained group – is amazing." The warehouse space includes three-level racking systems, with wheelchairs on each level. Although pediatric wheelchairs often take longer to fix because of the electrical components involved, Runions estimates the workers refurbish at least 200 pieces of equipment each month. The used wheelchairs come to South Central through various Chair Corps around the U.S. These are volunteer groups that collect the equipment through Wheels for the World and then ensure corporate partners like Walmart® pick them up in tractor-trailers. The corporate partners transport about 10,000 items per year to restoration facilities at 15 prisons around the country. CoreCivic operates two of these facilities, including Metro-Davidson County Detention Facility in Nashville, Tennessee. Once the items are restored, each recipient gets a custom-fit chair or other mobility aid and training on how to use it. Plus, through DVDs created by Wheels for the World volunteers, inmates learn about the people who benefit from their work. The DVDs show footage of the recipients using the actual equipment South Central inmates restored. The men earn hourly wages for their work, and can use their earnings to buy commissary snacks and other items. But being part of the Wheels for the World mission is more about giving back than getting anything in return. "It brings them a lot of joy," Runions said. "I get a lot of inquiries about the program." Runions goes the extra mile by taking mission trips once a year to distribute more chairs to people in need. One of his most recent stops was Sinaloa, Mexico, home of the infamous drug cartel and a region of deep-seated poverty where people mainly work on farms and ranches, if they are able to work at all. "I've seen parents carry children in their arms – they might be 18 years old – just to get a wheelchair," Runions said. Thomas M. is one of South Central's Wheels for the World participants. He takes great pride in helping people, just like those in Sinaloa. Although he started out simply looking for a job, his enthusiasm grew when he discovered how vital the work is. "Working is good, but when you are helping people, it's a blessing," Thomas said. Aside from that, he added, it's helping him get used to working a regular job again, easing his transition into the workforce after release. Like Thomas, each Wheels for the World participant is required to interview for the program before joining. In order to be eligible, inmates must be without disciplinary or behavioral issues.